I have to admit, even though I cook multiple times a day nearly everyday....there are several days where I really don't want to stand over the stove. The husband and I usually take turns cooking but I do the majority of the dinner making since, well, he spends all day cooking for his job. I love to cook but when dinner time rolls around I'm usually tired, hungry, and ready to just collapse into bed with some Netflix. Since the theme of August's What I Ate Wednesday is summer staples (and seeing pictures of the same food I eat every day is boring), I thought I would share with you one of my staple dinners on nights where I don't feel like cooking but need something fast and easy. It's simple, takes hardly any time to cook, and is super satisfying. We have this for dinner almost once a week and truthfully, I could eat it every.single.day. It keeps me full, has a hefty dose of good protein and fats and takes minutes to whip up. Plus, there's bacon. What else do I need to say? 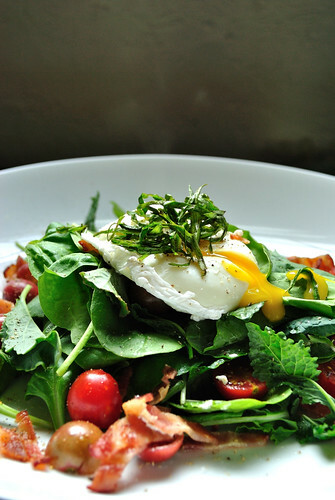 I like to top my BLT salad with a poached or over easy egg for maximum deliciousness and staying power. Hard-boiled eggs also work well with this salad. *Here is a quick & easy way to cook bacon: Preheat oven to 350F and place bacon on a baking sheet. Place in the oven and cook to your desired crispness (I usually cook it for about 15 minutes). Remove bacon from baking sheet and place on paper towels to drain. 1. Combine all ingredients (except for egg & vinegar) in a large bowl and toss to combine. 2. 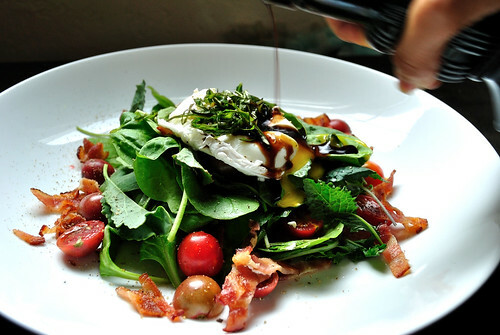 Top your salad with your egg of choice, a drizzle of balsamic, and enjoy!